The definitive Canadian English dictionary, with 300,000 words, senses and definitions. Definitions, worded for ease of comprehension, are presented so that the meaning most familiar to Canadians appears first and foremost. Each of these entries is exceptionally reliable, the result of thorough research into the language and Oxford's unparalleled language resources. 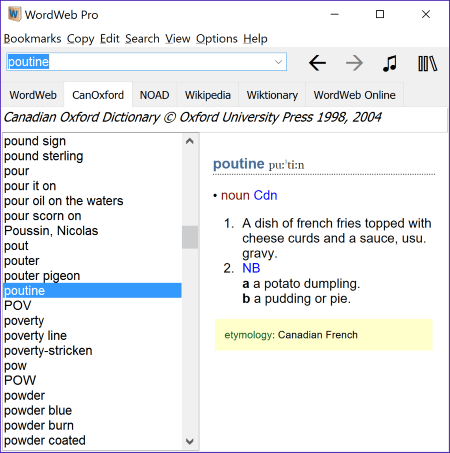 Five professionally trained lexicographers spent five years examining databases containing over 20 million words of Canadian text from more than 8,000 Canadian sources of an astonishing diversity. The download size is about 14MB (you can also order a CD-ROM).